In the last few weeks, Marvel’s newest film Black Panther has shattered domestic box office records, and has had a strong showing international box office, being No. 25 on the list of all-time best openings. But what has been key to these films’ success is not only the well-developed story, characters, and fictional worlds the filmmakers created, but Disney’s recent efforts to reach a their target audience through cultural marketing. Cultural marketing​ is essentially aiming one’s marketing efforts towards consumers of a certain culture or demographic. Disney was conscious of this even in the early stages of both films, hiring a nearly all black cast and production leads for Black Panther, and hiring Hispanic leads and production roles for Coco. 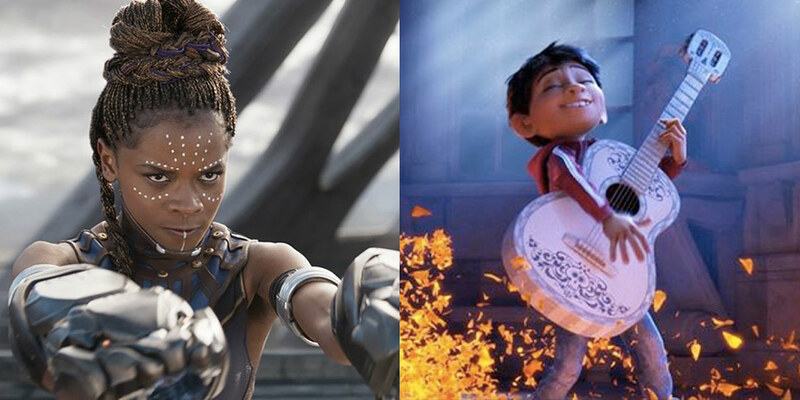 According to ComScore, African-Americans have made up the largest share of domestic audiences for Black Panther at 37% (while black audiences usually make up 15% for such films), and their recent animated feature Coco (2017), which recently passed $700M for the worldwide box office, and is the highest grossing movie ever in Mexico. Admittedly, no other film studio can afford to fund their marketing initiatives like Disney can, but aspiring studio execs and independent filmmakers alike can certainly learn a lot from their multi-million dollar campaign and the creative marketing partnerships they sought out for their films. Most recently, Marvel’s Black Panther​ focused its marketing efforts on moviegoers of African descent, not only here in the US, but abroad. During the College Football National Championship on ESPN, whose parent company is Disney, the studio hosted African-American musical artist Kendrick Lamar for a half-time show performance of the lead single from his album Black Panther: The Album, which also served as a soundtrack to the film and debuted at No. 1 on the Billboard 200 album chart. Disney Consumer Products organized a fashion show during the New York Fashion Week called ‘Welcome to Wakanda: Fashion for the Black Panther Era’. Disney also did not forget about the international market, naturally focusing on Africa, organizing a separate premiere in South Africa and large-scale pre-screenings in both Nigeria and Kenya. Disney/Pixar’s Coco​ was similar, focusing on the Hispanic population. ABC’s Dancing with the Stars premiered the song ‘Remember Me’ with contestant Nikki Bella dancing in traditional Mexican attire. Disney even had a Coco-themed float in the Dio de Los Muertos parade in Mexico City. Disney also had partnerships with a variety of companies, to further market the film. Airbnb promoted Coco by making an effort on their site to promote experiences in Mexico leading up to the release of the film, as well as offer family-friendly tips for traveling there. The Mexican food company Herdez also got in on the action, offering customers a chance to see Coco for free if they bought two jars of Herdez salsa in one transaction. Despite the success of both these films, one might raise the question whether this form of marketing truly works, or if it may alienate other groups? There is obviously a risk. But in this marketing, it makes the majority of its marketing universal, while focusing individual marketing efforts toward their key demographic. As with many studio-produced Christian films, marketing execs start a grassroots movement among their target audiences, and gradually create a wave of interest. And if you can make one demographic group really passionate about a film, then their enthusiasm for the content and characters will inspire them to tell people outside their own demographic, leading to further interest. And this seems to be Disney’s thinking when it comes to their recent films. As Disney is an international corporation, with their media being shown to audiences all around the world, and their worldwide marketing team and creative executives are very aware of what is culturally acceptable in individual cultures and countries. Disney is known to not only tailor their marketing to individual cultures, but elements of the film itself to individual countries, even for their more universally-marketed films. In the 2016 film Zootopia​, Disney 3 had a different animal stand in place of news anchor Moosebridge that appropriately corresponds to each particular country. These different newscasters included a raccoon/dog in Japan, a koala in Australia, a jaguar in Brazil, a panda in China. In their 2015 film Inside Out​, the main character Riley as a toddler is disgusted by the vegetable broccoli, and this was changed in Asian versions of the film (as children there love broccoli) to green peppers. The filmmakers also altered the hockey scenes to look like soccer/futbol scenes, as they recognized many countries would recognize that sport more than ice hockey. There is also a scene where “D-A-N-G-E-R” was changed for each language (even changed the direction that the character points to the characters/letters). These changes may seem superfluous, but with Inside Out making over $850M and Zootopia making over $1B in total box office revenues, it seems those efforts have paid off. What is left to be seen is how Disney will market their upcoming ‘cultural’ films such as Mulan (2018) and Aladdin (2019). Mulan already focused its casting in mainland China, with a team of casting directors visit five continents and see nearly 1,000 candidates of Chinese origin for the title role. Aladdin took similar efforts, eventually forming a cast comprised of actors of Middle Eastern/Oriental descent, with the actors’ ethnic backgrounds including Iranian, Turkish, Indian, and Egyptian. But it can be sure that this trend of cultural marketing for Disney films will not be going away any time soon (and that other studios and productions companies are likely to follow suit)!